Committee of Human Rights Reporters : Amin Arman who was among the group of activists arrested at a gathering on Tuesday October 30th, is in an unknown condition after being transferred to ward 209 of Evin prison. According to news obtained by Committee of Human Rights Reporters, Aerospace Engineering student at Science and Research University (Oloom va Tahghighat), Amin Arman who was detained 19 days ago has been barred from visitation. His family living in Kerman province was able to speak to him one time by phone and have not seen him. During the raid of the gathering of writers at Saray Ahl-e Ghalam, security agents detained close to 70 individuals. Most of them were later released and 17 individuals including Mehdi Khazali were transferred by van to Evin prison. Two others named Pejmand Zafarmand and Mehdi Karimi were detained in separate encounters and also transferred to Evin prison by security agents. 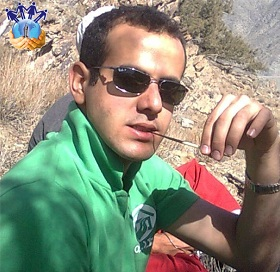 Mehdi Karimi was a service employee and had no political activities at the gathering. Mohsen Ghashghayi, Pejman Zafarmand, Mehdi Khazali, Hejatollah Nokhostin, Afshin Ghorbaninejad, Mohammad Parsi, Amin Arman, Mohammad Farid, Mehdi Kerimi, Akbar Amini, Mohammad Bagher Moradi, Mohammad Reza Ahmadi, and Reza Mahboub. Support Amin Arman NOW! Don't wait for "Regime change"
serious concern about the health and well being of Mr. Amin Arman who has been unjustly incarcerrated only because of his independent views and social activitism. These savages are reform-proof and warmongers.